I came across this recipe several months ago. I can’t seem to find my source. I thought that I found it on a male person’s blog, but have not been able to find the blog. I can’t take the credit for this divine muffin. Divine it is and that is why I wanted to share it with you. You are going to need coconut oil and coconut milk. Two staples in my kitchen, but they may not be staples in your kitchen. Next time you are grocery shopping purchase these two items and keep them in your pantry so when you have those ripe bananas and need a chocolate fix, you can whip up a batch. 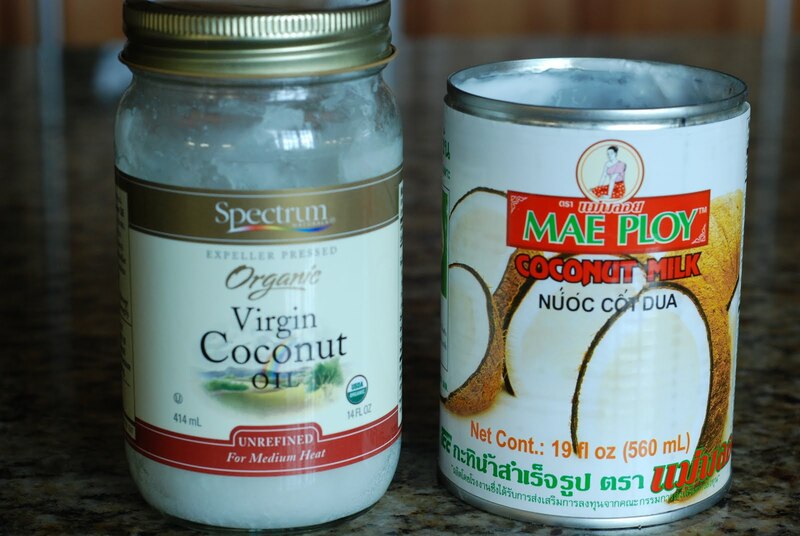 During cooler months the coconut oil will solidify. Place the bottle in a bowl filled with very hot water and let it sit there while you are gathering the other ingredients and it will melt. 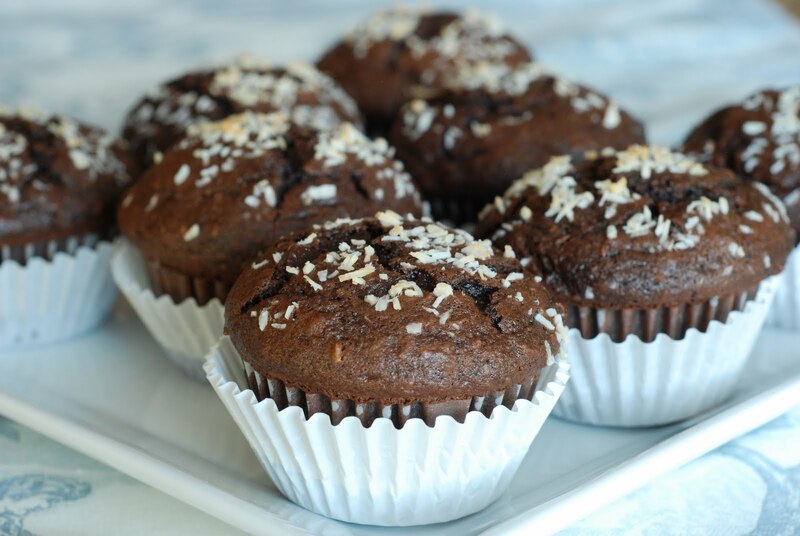 For the muffins you will need 3 very ripe bananas, brown sugar, unsweetened coconut, brown sugar, flour, buckwheat flour, baking soda, baking powder, salt, cocoa, coconut milk, coconut oil, eggs and my addition to the recipe, semi-sweet chocolate chips. Remember “mise en place”? That’s what I just did. Gather all your ingredients and have them ready to go. Line a muffin tin with paper muffin cups. Set aside. Mash the ripe bananas with a fork and set aside. I like to mash them until they are smooth. 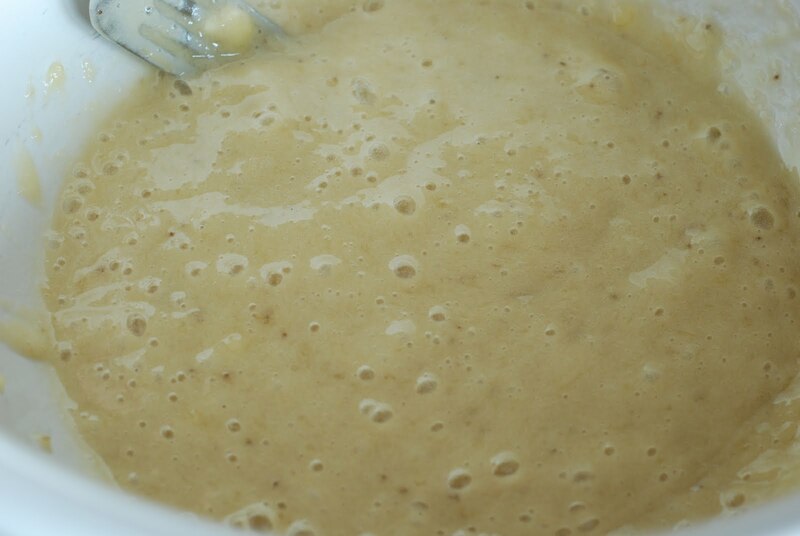 If you like banana chunks in your muffins, then don’t mash them so much. 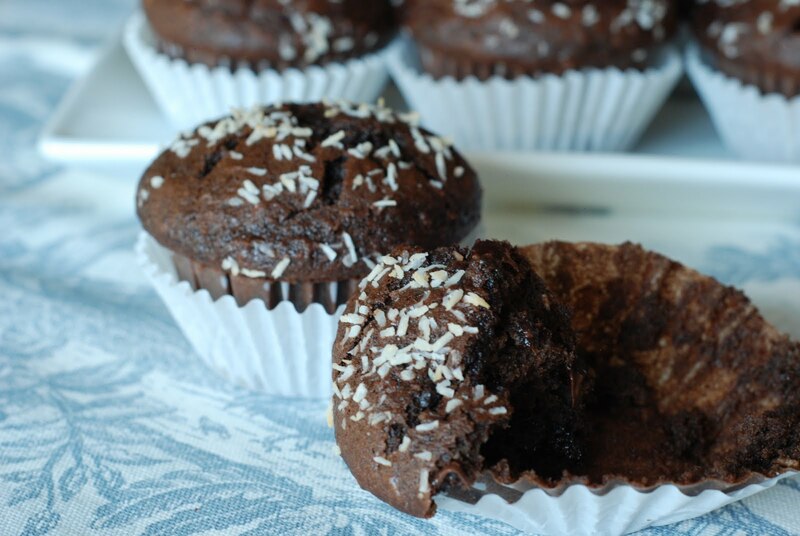 They are your muffins so you might as well make them the way you like – right? 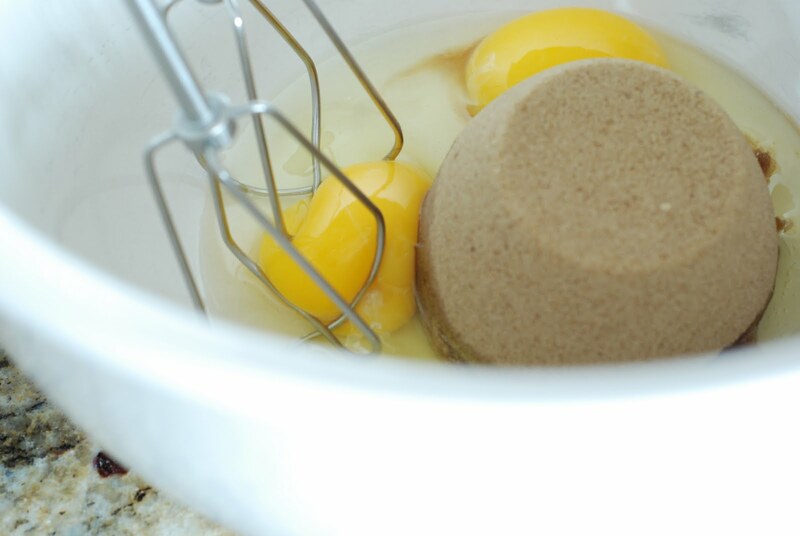 In a large mixing bowl, beat together eggs and brown sugar. …and baking powder, baking soda and salt. 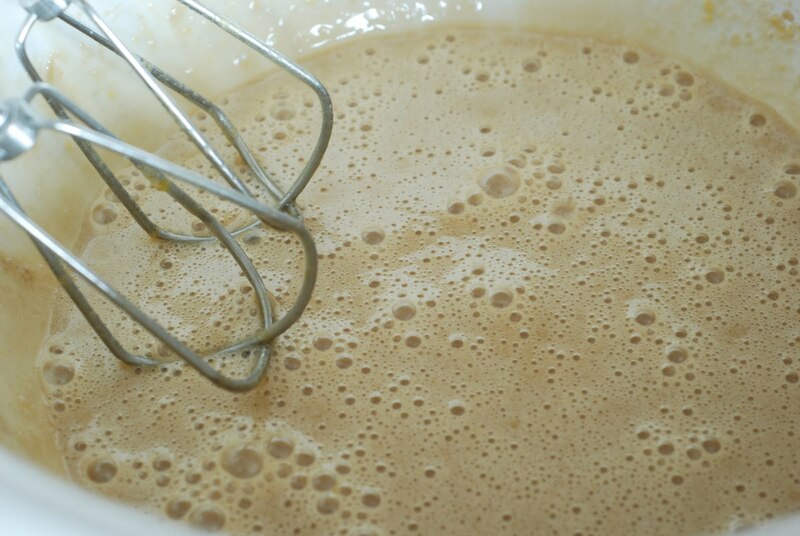 When the dry ingredients are whisked together, add to the wet mixture. Mix just until the dry ingredients are well blended. Now you are going to fold in the mashed bananas that you sat aside. You don’t have to be too gentle folding in the banana’s. Just make sure they are blended well, but don’t beat them to death. Now fold in the semi-sweet chocolate chips. This is my addition so if you don’t want chocolate chips, you don’t have to add them. Why wouldn’t you want more chocolate? 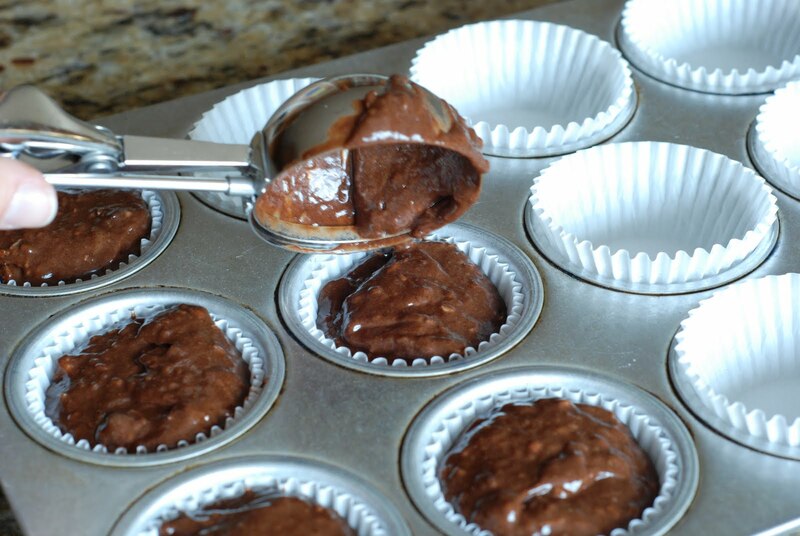 Scoop the batter into the paper lined muffin pan. I use a 1/4 cup ice cream scoop. It’s so simple because it measures each muffin exactly with very little mess. 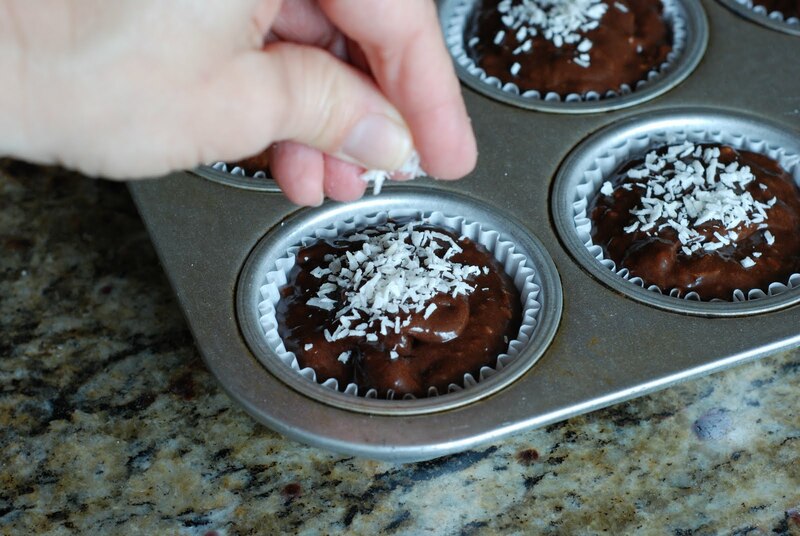 Sprinkle the tops with a bit more unsweetened coconut. Place in a preheated 350 degree oven and bake for 20-25 minutes. 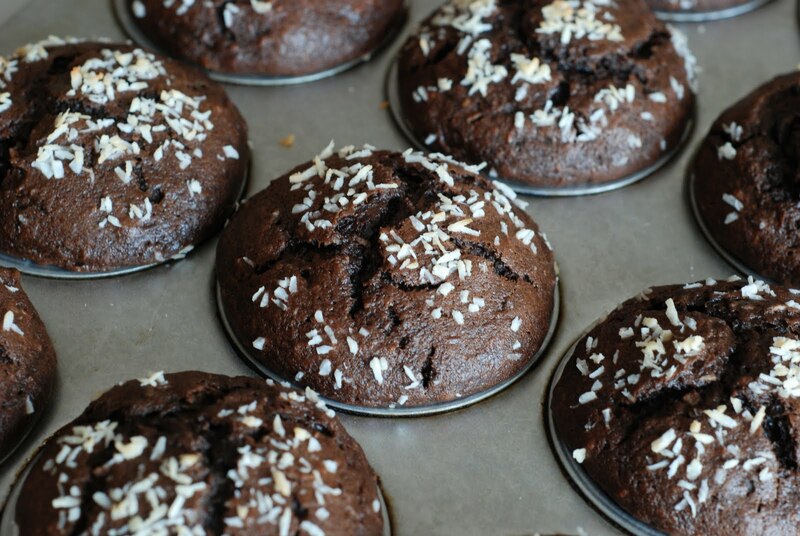 These muffins mound up so nicely. I just love how they look when I pull them out of the oven. You may want to let them set for about 5 minutes before you remove them from the muffin pan. We generally eat them right away, but you can put them on a cooling rack to cool if you’d like. 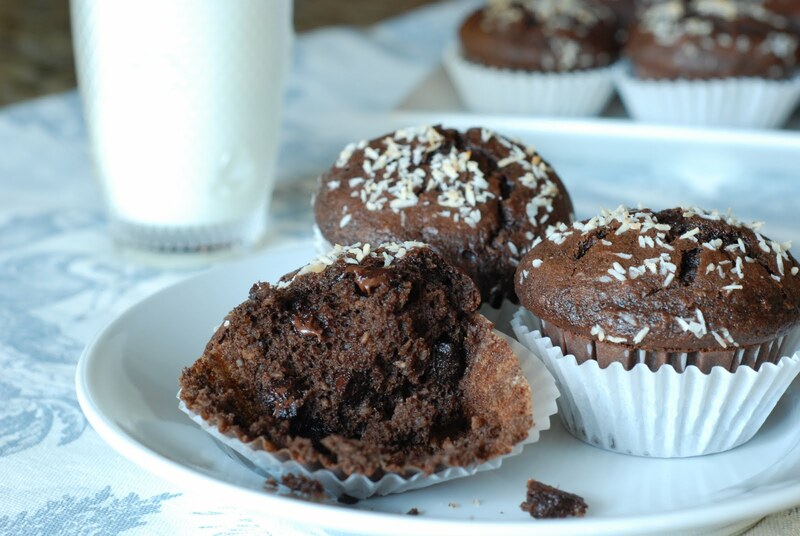 These muffins are great with a glass of milk…well I don’t actually love milk and don’t drink it with anything, but Matt likes milk with chocolate…you can trust him. …I should really take some to Sue because she is the one who has to take care of Jim who just had the nasty back surgery! Love you guys! 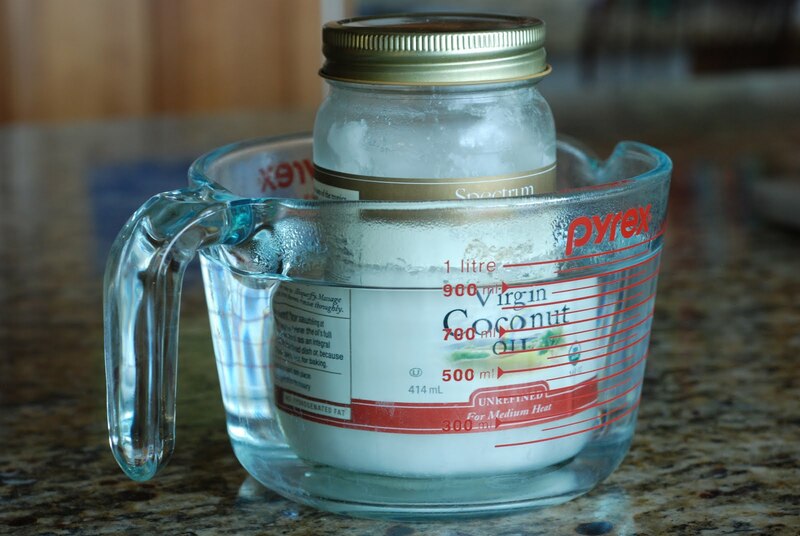 *In a small pot, heat coconut oil on low to medium heat until melted and measure. 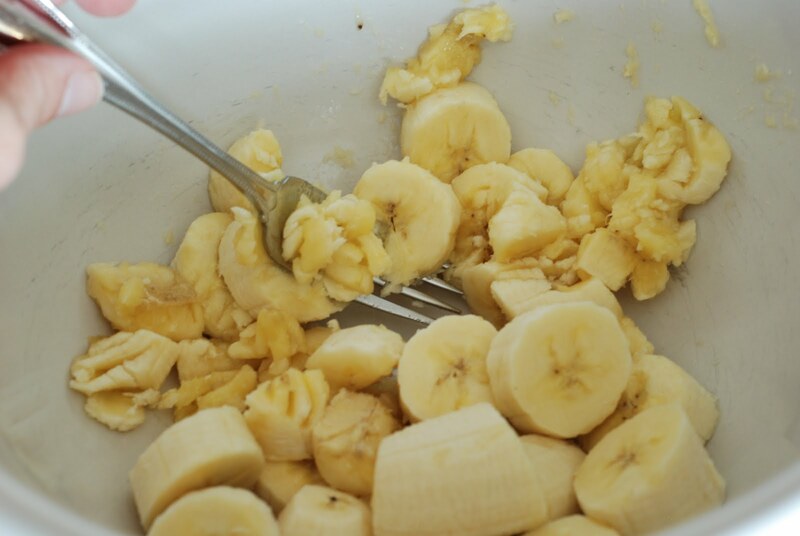 In a bowl, mash the bananas with a fork; set aside. Preheat the oven at 350 F. Fill a muffin pan with papers and set aside. 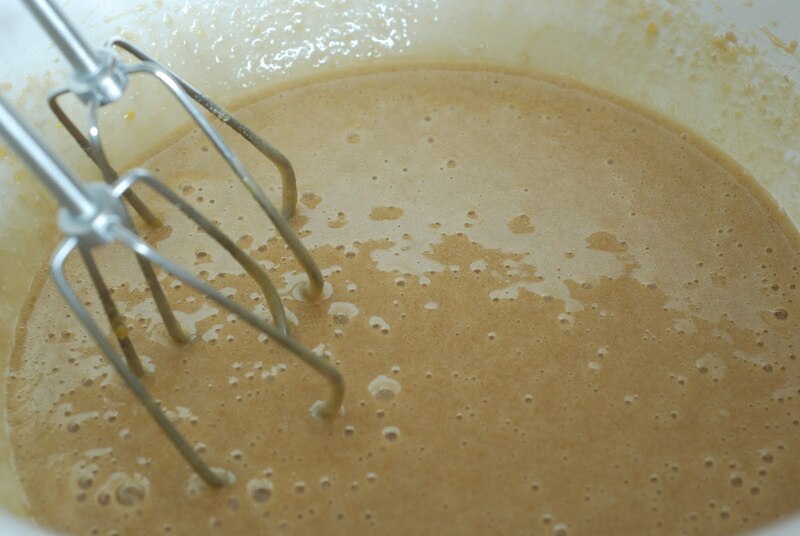 In a large mixing bowl, beat the eggs with the sugar until light and fluffy. Add the oil and mix well. Add the coconut milk and mix. 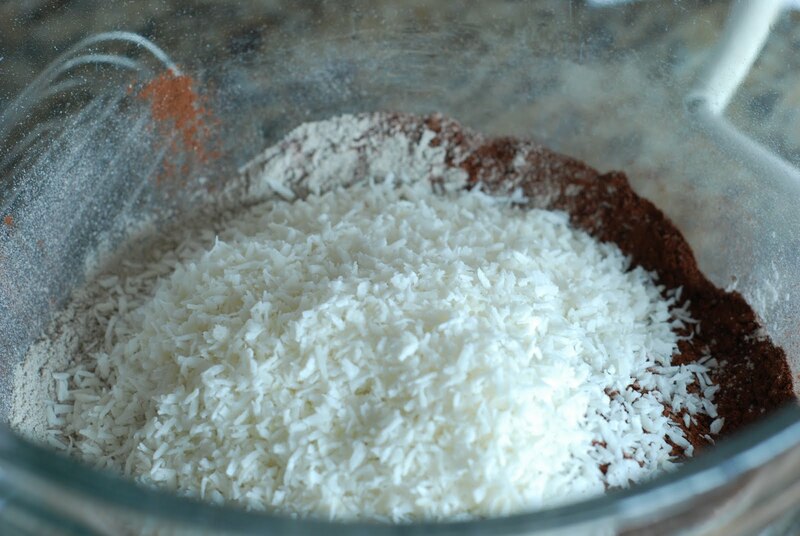 In a bowl, combine the flours, grated coconut, baking powder, baking soda and salt. Add the dry ingredients to the wet ones and mix until just combined. Fold in the bananas. Fill the muffin pan. Sprinkle with more grated coconut and bake for 20- 25 minutes. 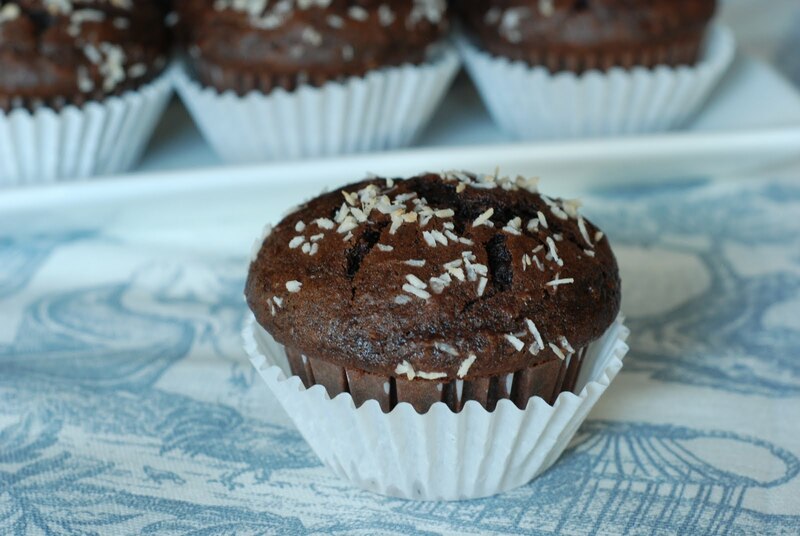 I’m calling these muffins “health food” because they are made with some buckwheat flour. Chocolate, bananas, coconut…all good for the body. Make some…for your health! Made these muffins today for the rirst time. I followed the recipe as written except for the coconut milk as i only had coconut cream instore. I could not wait to try them so had an early afternoon tea. They are yum yum yum. I thought the 1/2 cup of cocoa powder was going to be too much. I used a full 200g bar of dark chocolate broken into bits. The ingredients all blended in well for a great tasting muffin. I will be making these again forsure! So great to hear. Thank you so much for your feedback. This recipe sounds great! How many muffins does this recipe make? Depending on the size of your muffin tins, it can make 12-18 muffins. If I can't find buckwheat flour, can I just use all-purpose? What adjustments should I make? Sure. Just replace equal amounts of all purpose flour. You could even use whole wheat flour. I finally made these muffins last night after I received my new lodge cast iron muffin pan. I only had one banana on hand, so substituted the missing bananas with apple sauce. Cut up half bar of 70% dark chocolate (really should have just put in the entire bar). These muffins came out really moist and rich. Thanks for the recipe! Thanks for your comment and your substitution ideas. I don't always have ripe bananas around and now I will try applesauce. Thank you. Holy cow… I just happen to have ripe bananas! I'm going to sneak out to yoga tommorrow and grab some coconut milk! I hope that inferior Smith's carries it! Haha! I love how you labeled these as health food. They look like they would speed a healing back, or a least bring real pleasure to a 24/7 unpaid nurse! Good luck Saturday…love ya big! Wow! That means a lot. Especially since I'm such a novice. I owe it all to Ann Marie who came to my kitchen one morning and tried to help this old dog with something new. Like how to turn on my camera. Although your recipes look delicious, what makes me return are your awesome pictures! I may one day succumb and actually make them.